The first time I saw the Bordered mantis, Stagmomantis limbata, she was no more than half of an inch in length. She was resting on a fuzzy Asclepias eriocarpa leaf, common name woolly-pod milkweed. 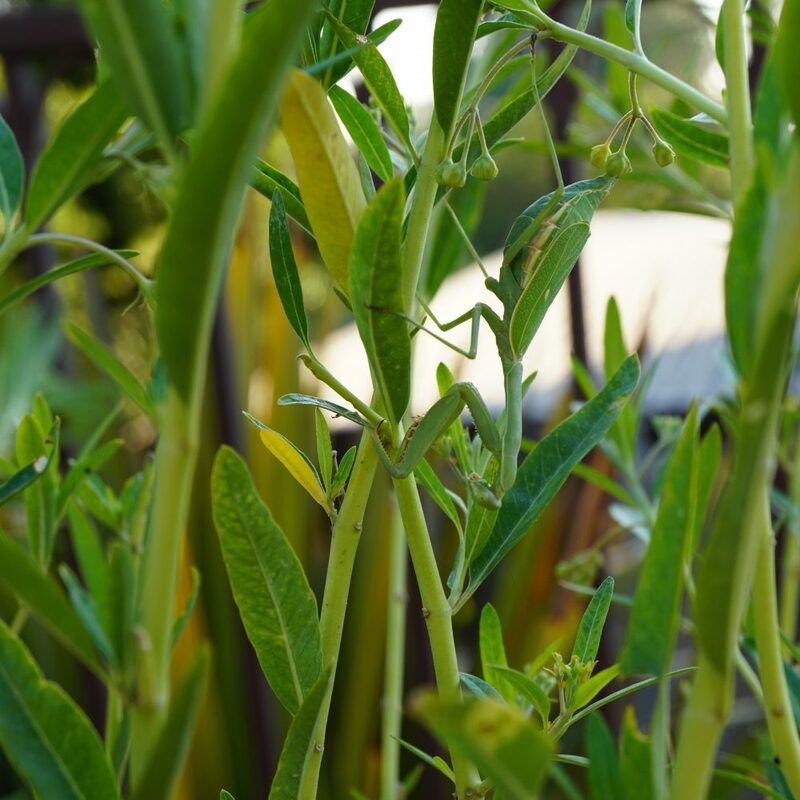 If the milkweed’s leaves were not a few shades of green darker than the mantis, I would not have noticed the creature apart from the leaves. I saw a bit of bright green and there she was, a minute insect waiting for even smaller insects to wander within her striking perimeter. After that discovery I looked for her nearly every day. One day I could not find her anymore. On another day, I found what I refer to as a mantis ghost, the delicate husk that a praying mantis leaves behind after it outgrows its exoskeleton and molts. 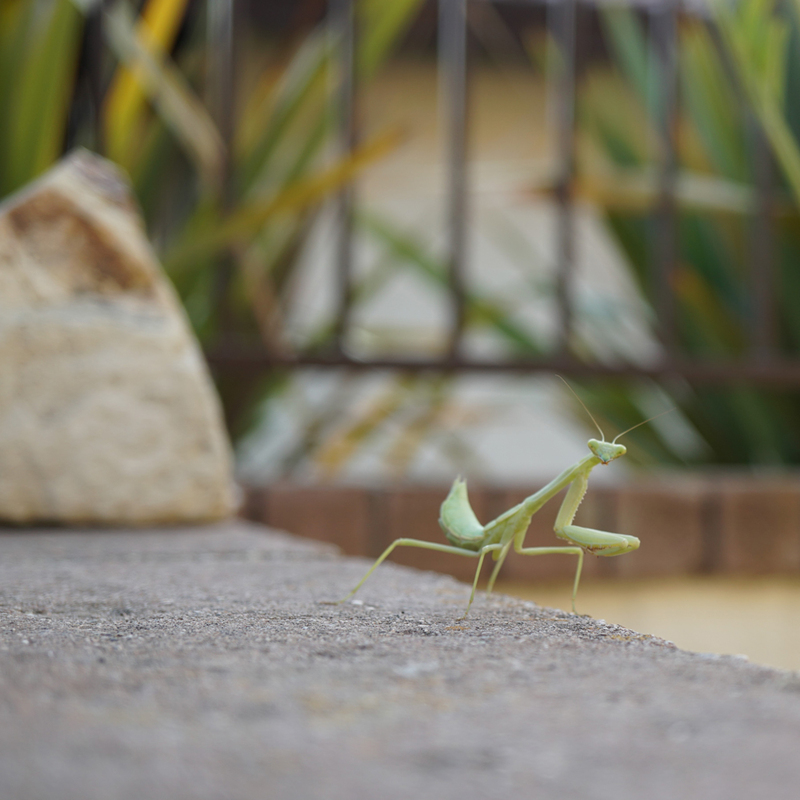 As the weeks went by, I looked for the mantis, or for any mantis really, because how would I know if the next mantis I saw was the mantis I had been following on the woolly-pod or some other mantis? I found myself missing a diminutive insect that had, briefly if measured by the human perception of time, found refuge and sustenance in the microcosm of the woolly-pod’s soft, spade-shaped leaves that are sometimes compared with a sheep’s ears. Indulging in a bit of nostalgic anthropomorphism could do no harm. For her, the time spent on the woolly-pod was not brief, nor was the world a small one. The springtime return of the woolly-pod, a milkweed native to the chaparral and oak woodland plant communities, was a reward in itself. My purpose in planting it was to attract Monarch butterflies. Milkweed is the host plant for Monarchs. Females will lay their eggs only on milkweed and the caterpillars cannot eat anything else. 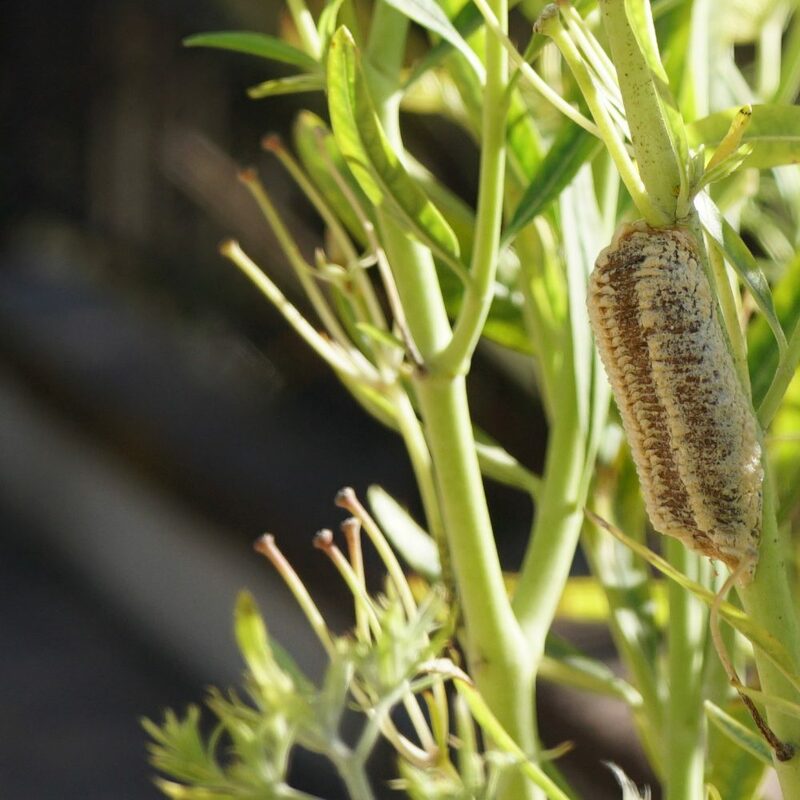 The Woolly-pod came back stronger and taller the second year after planting, with an adequate number of sturdy leaves climbing up its main stem, enough to attract butterflies, provide sustenance for caterpillars and shelter tiny monsters. As spring gave way to summer, I found more mantis ghosts. Cool, marine layer mornings faded by July, and the complexity of summer increased. After several waves of successful metamorphoses, most of the Monarch caterpillars were falling prey to the parasitic reproductive habits of the Tachinid fly, whose numbers were high enough by mid-summer that a couple generations of caterpillars were made thralls of the fly. A healthy-looking caterpillar about to pupate one day would be found the following day hanging slack, thin and trailing a couple white filaments originating from a pinhole in its body. A small brown spot on a chrysalis was also a sign; the spot was followed by the pinhole and filaments. The abandoned filaments were the ropes used by escaping fly larvae to rappel down to the ground where they wiggled their way into hiding places underneath the leaf litter and hardened into pupae. They would emerge some days later as adults. The Tachinid fly was not an intentional or accidental import from some other region or country, I was witnessing the enforcement of a balance mandated by evolution and required for the health of the local biome, exerted by a force that neither knew of, nor cared about, my personal butterfly project. I had interfered with that balance by planting milkweed from Asclepias physocarpa aka balloon plant, a native of southeast Africa, because the native milkweed species were slow growers. I continued my interference by destroying all chrysalides with signs of invasion as well as any fly larvae that I could find by wrapping them in plastic and putting them in the freezer for a couple days. In the early fall, the Tachinid predation subsided and the caterpillars began to thrive again. During this time, I found more mantis ghosts and noticed that they were growing in size. One morning I discovered an adult female mantis hanging upside down from a flowering branch of the balloon plant. If a breeze swept across her branch she became part of the branch, rocking gently back and forth. Numerous honey bees foraged among the plant’s white blossoms. They gathered nectar or pollen, working flower after flower. When a bee decided it was time to fly back to the hive, her departure was as abrupt, like her arrival, as if she had been called by a bell I could not hear. She returned to the hive, which was located somewhere nearby, probably in a tree, to deliver food to the young bees, the lay about drones and the queen. The bees approached each cluster of flowers with care. Some flowers received longer visits then others, others were passed over. A few days after I discovered the mantis, I found her chewing through the thorax of a honey bee. I had hoped that she was eating the oleander aphids, a pest that has a preference for the liquid in the leaves of toxic plants, including milkweed. The mantis showed no interest in the aphids which are themselves toxic and thus protected from many predators. Her method was to wait, camouflaged in plain sight, clinging to the branch beneath a cluster of open flowers, ready to ambush the next bee that came near. By the time she disappeared in late summer, the mantis had been courted by four suitors that I knew of. At least one of the four did not escape with his life. She left behind an egg case, an ootheca glued to a sturdy milkweed branch. In the spring, assuming the overwintering goes well in the egg case, up to a couple hundred young mantises will emerge from the case to start the cycle again.